Find Animal is a free Windows 8 game app in which you need to find and hit the same animal given in the grid with the animal given at the bottom of the screen. Windows 8 Find Animal App for Windows 8 has been grouped up into three basic categories such as Easy, Medium, and Hard levels. As you clear one level, it will immediately take you to the next level. Initially, when you start playing, it shows a hand sign, pointing towards the animal which you are supposed to hit. The hand is basically a hint for the beginners. 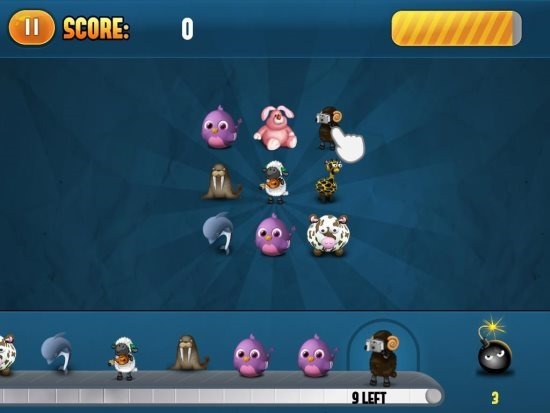 As you hit the pointed animal, remaining animals will be displayed at the bottom of the screen. Now, the challenge is that you are required to hit all the animals before finishing the energy. You can view available energy at the top right-side of the screen. However, in case you are unable to hit all the animals on a given period of time, it will give you a warning sound. Soon the game will get over if you are unable to finish the game even after the warning sound. In short, Find Animals a good entertaining Windows 8 game app, developed especially for kids. Try Find Animal game app for Windows 8 available under the Games category within Windows 8 App Store.